First we have a new icon, which I think looks better on the screen. Thank you for your comments and feedback. Based on reviews and comments the next release will have a few noticeable changes. 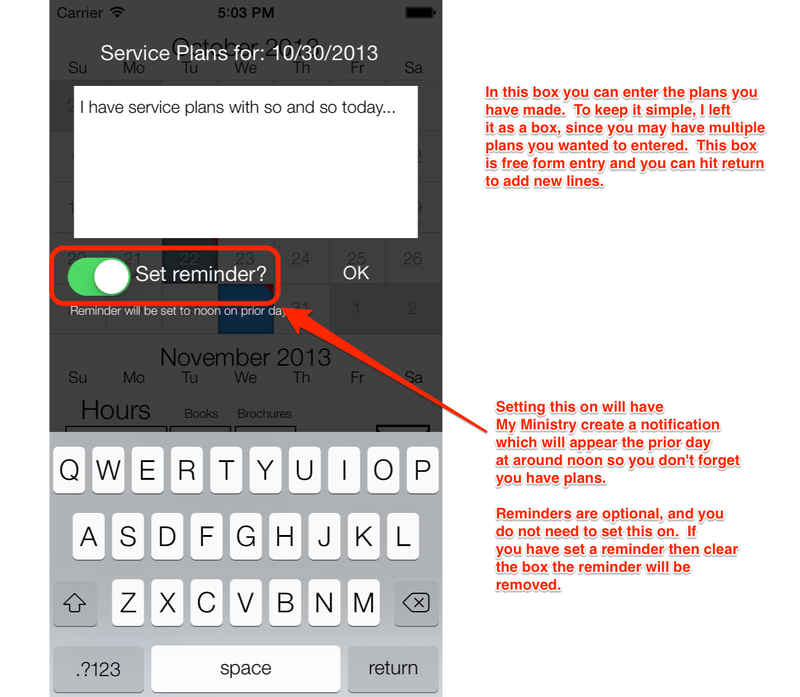 First I have added the ability to set service plans on your calendar in My Ministry. You will also have the option to set a reminder for the plans which will send an alert the prior day around noon, so you can prepare for your plans on the following day. I decided to keep it simple, and allow you to free type in the box all the plans you have. 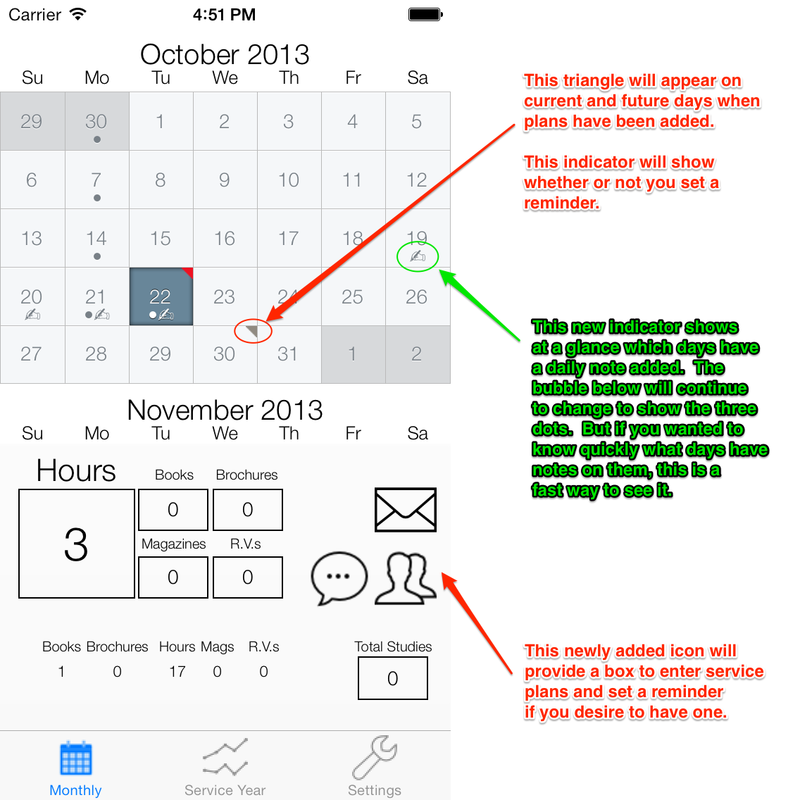 When you select to add plans to the day you will be prompted with this overlay to add the details of your plans. How do I put partial hours? Per say if I go out 1:15 one day and 1:45 another. I tried and it does not add it right. Please help! You need to add them as portions of an hour. i.e. 15 minutes = .25, 30 minutes = .5, 45 minutes = .75. The totals works with full hours & fractions of hours, but doesn’t total based on minutes. Hope that helps. If you had 2 hours and 30 minutes, you would enter it as 2.5 hours. Thanks for the comments! I appreciate the feedback. My answer is yes/no. My goal for this app was a simple time keeper, not a call book replacement since several people I knew didn’t want the extra features and complexity of that. I am working on a separate app for managing calls, visits, etc. But it will be just a call book. It won’t be a reporting app to allow the most flexibility. It will track what you left on your calls, discussions, questions, etc. That other app is a ways out as I am really working on the interface so it’s simple, clean and fast. I don’t want to just replicate what’s out there, but create a book that is just like a paper book. For the past few months it will not email my time. It will always try to text or not email it. Please ensure your email/text toggle is set to email.